From a place of social privilege, what is our duty? Can an individual or group truly impact others in a meaningful way? What kind of world do we seek to create? Devin Dunlap is a member of Karen Bald's Public Service Class at The Fletcher School. 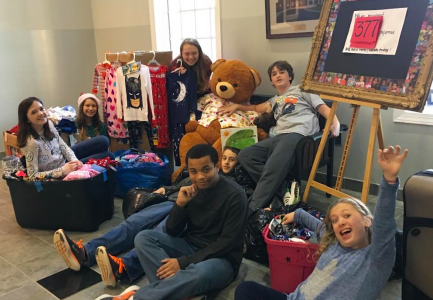 This year, prior to the holiday season, the class set out to collect pajamas for area youth whose family circumstances do not always support purchasing new or warm clothing. Joining a nationwide Scholastic Pajama Drive, Fletcher's participation ensured that every set of PJs collected would be matched by a book from Scholastic, before being distributed to deserving boys and girls via nonprofit Organizations throughout the region. This year, the national drive managed to collect 98,070 sets of pajamas. The Fletcher School - enrolling just over 260 students - contributed 398 of those sets in 2016. The addition of a book to this special holiday gift is especially poignant and meaningful. Our students know how important books are, and how vital reading is - and they want to share their passion for reading and learning with the world, one kid at a time. But back to Devin Dunlap. Devin was aware of an important organization in Charlotte, Big Brothers Big Sisters of Central Carolinas, a mentoring program for youth facing adversity. He knew that BBBS did not currently participate in the pajama drive, and had not previously applied to receive pajamas for the many kids that they serve in the greater Charlotte region. So, he reached out to the CEO of Big Brothers Big Sisters and suggested that they apply. BBBS followed through, and this year they received and distributed 100 of the sets of pajamas that The Fletcher School collected. As the BBBS CEO noted, "A lot of boys and girls ages 5- 14 years will be warm and comfortable when they go to sleep each night this winter because of the generosity of The Fletcher School students. We are so grateful! Teaching young people the importance of giving to those less fortunate than they are, is a very special gift!" The CEO was able to thank Devin herself, immediately, because she is Donna Dunlap, Devin's mother (she is also a Fletcher Board of Trustee member). And during this season of giving, Devin was able to answer some of those big questions that he wrestles with. Can an individual truly impact others in a meaningful way? One hundred Charlotte-area families will say yes because of one individual, one extraordinary 8th Grader, the classmates in his Public Service class, and the enormous generosity of the Fletcher community. What kind of world do we seek to create? Devin's world is humanistic and compassionate, sharing precious gifts of warmth and learning with others; serving the greater good. It is a caring world, seeking always to become a better world. It's a world that can learn something important from a quiet, thoughtful young 8th Grader.